When traveling in space, astronauts experience physiological changes normally associated with aging, such as bone loss, muscle deterioration and altered immune systems. When the astronauts return to Earth, the changes often reverse. 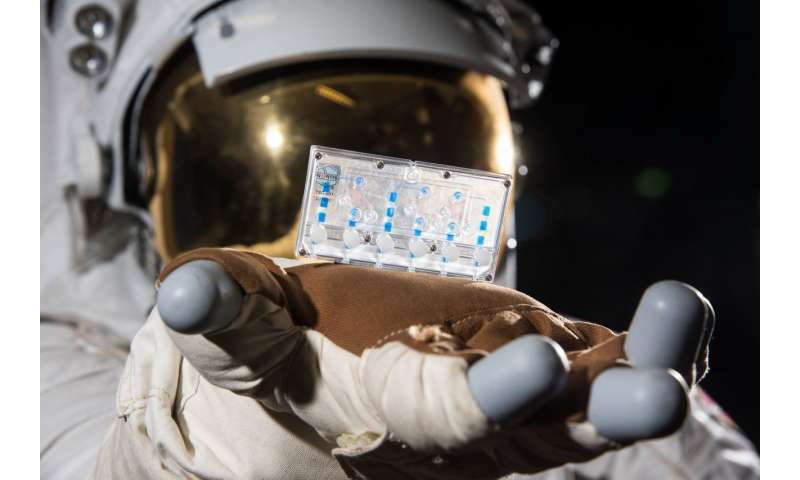 To better understand the relevance of the astronauts' experience to human health—both on the ground and beyond—NIH's National Center for Advancing Translational Sciences (NCATS) partnered with the International Space Station U.S. National Laboratory (ISS National Lab) to send tissue chips, a research technology that reflects the human body, into space. The ISS National Lab and NASA partner to use the U.S. portion of the space station for research initiatives leveraging the unique microgravity environment in space. Tomorrow, a set of tissue chips that model aspects of the human immune system is scheduled to launch on SpaceX's 16th commercial resupply mission (awarded by NASA) from Cape Canaveral, Florida, to the ISS National Lab. The chip set is the first of several supported by the NIH that will travel to the ISS National Lab over the next few months. Led by NCATS through its Tissue Chips in Space initiative, researchers at the University of California, San Francisco (UCSF), developed the immune system chip to explore the relationship between aging and immune responses and to look for possible ways to slow the aging process. "Research on the ISS National Lab is creating unprecedented opportunities for scientists to study microgravity-induced changes in human physiology relevant to diseases here on Earth, as well as to accelerate the development of translational technologies for earthly applications," said NCATS Director Christopher P. Austin, M.D., the U.S. Department of Health & Human Services and NIH liaison to NASA. "NCATS' research carried on today's launch will not only contribute valuable knowledge on the aging process but also may reveal new approaches to ameliorating the effects of aging." Designed to work like human organs, tissue chips mimic living human tissues and cells. Each immune system chip includes three types of cells: a specific type of immune cell; cells from bone marrow, which make immune cells; and cells from the lining of blood vessels, where immune cells encounter infection.A few dozen of the immune system chips are traveling to the space station, where they will stay in an incubator. After two weeks, the chips will be frozen and preserved. Later, they will be transported back to Earth for analysis. "By sending our immune chips into space, we'll be able simulate the aging process of the immune system and understand how it affects our body's ability to repair itself as we grow older," said Sonja Schrepfer, M.D., Ph.D., professor of surgery at UCSF and co-developer of the immune system chip. "We expect this research to give scientists new insights into the molecular basis for many human conditions, which in this particular project relates to how microgravity induces aging of the immune system that may lead to the development of novel therapies here on Earth," said Danilo Tagle, Ph.D., NCATS acting deputy director and associate director for special initiatives. Another launch, currently planned for March 2019, also from Cape Canaveral, will send kidney chips, bone and cartilage chips, and chips modeling the blood-brain barrier, which is a protective mesh of blood vessels and tissue that can stymie therapies from reaching the brain, to the ISS-NL. A planned April 2019 launch from Wallops Island, Virginia, will include a lung chip connected to a bone marrow chip, for studying infections. View the launch schedule for the most up-to-date information.